New windows are in your near future. You’ve measured your windows and are now ready to look for the perfect fit for your home. Windows may be a huge upfront cost, but if you play your cards right, your windows can pay for themselves. While Colorado’s charm is the four seasons, having all four in one week can wreak havoc on your home’s temperature. In Colorado’s crazy spring snows and blazing summer and fall heat, keeping the cold and heat outside and regulating temperature inside can change your energy bills. Picking energy efficient windows can save you between 25-40% on your energy bills. You’re already sold on the idea of energy efficient windows, but which one is best, double or triple pane? Double pane windows, or double-glazed windows are made up of two panes of glass separated by a spacer. These windows reduce heat loss by 25%. These windows are lighter than triple pane windows and are less expensive than triple pane windows. The frame of these windows helps a lot with energy retention. The frame is most commonly vinyl or fiberglass with a closed back frame. This design keeps the window from warping. The spacer that is used can also aid in the energy conservation and structure of the window. The glass that is used also plays a role. Two panes are better than one. The two panes work together to keep the heat in and the cold air out. If two panes are better than one, shouldn’t three panes be better than two, right? Many builders may argue that this isn’t always the case. These babies are a step up from double pane. Three panes of glass and two spacers sounds more energy efficient. With triple paned windows, you will notice a significant difference in the toasty-ness of your home. Triple pane also reduces outside noise coming in (and vice versa). Triple pane windows cost more than their two glass counter parts. Usually these windows will cost 10-15% more than double pane, except with Gravina’s Windows in Denver. 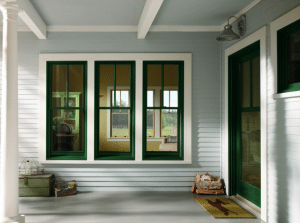 We have several price ranges of high-efficiency triple pane options. Contact us today at 303-936-7023 or find us online.